As we emerge from our long winter hibernation, we step out of our homes to witness signs of the world coming back to life. The days get longer and the sun is brighter and more intense than any other time of the year. The new angles of the rays fill us instantly with warmth, giving all living things a new sense of life and energy. Renewal is the theme this time of year. Each day the landscape changes, adding leaves to trees while flowers pop up out of everywhere. The leaves seem to unfold overnight adding a tender green color to the previously empty branches. This is just the beginning of one of Michigan’s best seasons. Spring is the transition time between the long winter and a season of bountiful locally grown produce. We start with tender green asparagus and greens and transition to heartier fruits and vegetables that will grace our summer barbeques. This spring, tender new vegetables will adorn every chef’s menu. They know that using an ingredient in season will improve the flavor exponentially, with very little effort. Michigan grows over 200 agricultural commodities, the second most diverse agricultural state in the nation. Michigan is a national leader in the production of tart cherries, second for beans, carrots, celery and plums. This menu celebrates one of Michigan’s first crops, Asparagus. Asparagus contains B6, A, C, E and K and is dense with niacin, folic acid iron potassium. 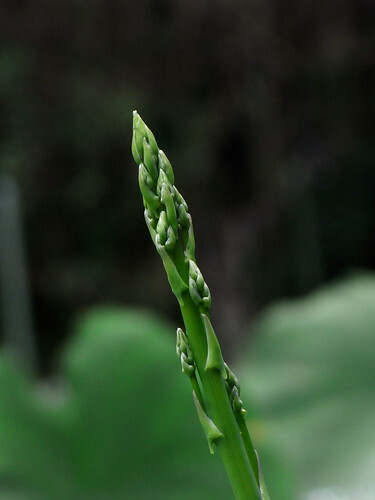 The trace minerals found in asparagus help to enhance insulin’s ability to transport glucose through the blood stream. The mushrooms are hearty and filling. They contain riboflavin, niacin and pantothenic acid- nutrients that help to break down proteins, fats and carbohydrates. This delicious dish will offers an excellent canvas of flavors and satisfies the heartiest appetite. Try this spring celebration recipe to kick off the long awaited season in a special way. Preheat oven to 350* Season chicken with salt and pepper. Heat Olive oil in a large skillet. Place the chicken, presentation side down, in the skillet and cook until golden brown, approximately 3-4. Turn breasts over and cook another 3-4 minutes. Place the chicken on a lined oven sheet and bake until cooked through, approximately 10-12 minutes depending on the thickness. Heat oil in a large skillet. Add the shallot and sauté approximately 5 minutes. Add asparagus and sauté 5 minutes. Add the mushrooms and continue to cook until they begin to brown. Once asparagus and mushrooms are tender, add the wine and cook until it evaporates. Add the thyme cook until fragrant, 1-2 minutes. Add the parsley and stir to incorporate. Season with salt and pepper to taste. Spoon over chicken breasts as a topping or serve as a side dish. Boost Your Quality of Life and Start Growing a Garden This Spring, Even If You Live in an Urban Neighborhood! Spring, sprint and salivate for Michigan agriculture!